The sixth-ranked Nebraska volleyball team swept Indiana 25-13, 25-19, 25-19 in its final Big Ten road match of the season on Saturday night at University Gym. 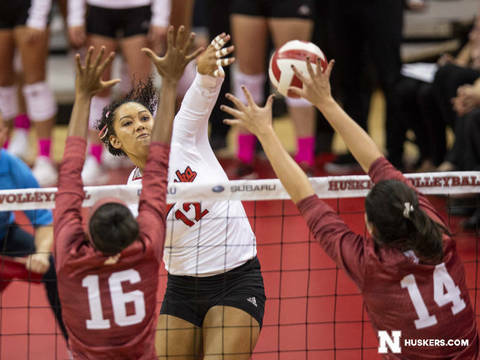 The Huskers (22-6, 13-5 Big Ten) won their sixth straight match, hitting .388 on the night. Nebraska had 49 kills and just nine attacking errors, marking the third time in the last five matches the Huskers have committed fewer than 10 attacking errors after doing so just three times previously all season. Mikaela Foecke paced the Big Red with 14 kills on .387 hitting. Lauren Stivrins had 11 kills without an error, hitting .524 for the match. Lexi Sun had eight kills with a .438 hitting percentage, her best as a Husker. She also had a match-high 16 digs and served two aces. NU held Indiana (16-13, 7-11 Big Ten) to a .216 hitting percentage. Kenzie Maloney had 12 digs to lead the defensive effort, and Stivrins had four blocks. Callie Schwarzenbach had six kills, and Jazz Sweet and Capri Davis each had four kills with just one error each. Nicklin Hames had 39 assists in the win. Indiana was led by Lexi Johnson’s eight kills. Set 1: Four different Huskers had kills to spark NU to a 7-4 lead, but Indiana came back to tie the set at 8-8. Stivrins posted a kill and a service ace to put NU back in front, 10-8, and Sun added an ace before Foecke hammered a kill for a 14-10 lead. Foecke tallied three more kills during a 5-0 run to increase the Husker lead to 20-11. Sun and Stivrins continued the onslaught of kills to make it 23-12, and the Huskers won 25-13, posting 16 kills on .438 hitting in the opening set. NU finished the set on a 14-3 run. Set 2: Sun and Maloney served aces, and Schwarzenbach and Sweet tallied kills for a 5-3 Husker advantage early in the set. Indiana held a 10-9 lead before Schwarzenbach put down a left-handed kill and teamed up with Sweet for a block to make it 11-10 Huskers. With the score tied 13-13, Nebraska took charge with a 7-0 run. Sweet and Sun struck for back-to-back kills, and Hames dumped a shot to the corner before Sun dug a ball over for a kill. Foecke and Stivrins stuffed the next Hoosier attack, and Megan Miller served an ace. After Indiana hit into the net, Nebraska led 20-13 via the 7-0 run. The Huskers finished off the 25-19 win to take a 2-0 lead in the match. Set 3: Nebraska started off strong, taking a 6-2 lead with kills from Davis, Schwarzenbach and Foecke. Back-to-back kills by Sun made it 10-5, but Indiana rattled off a 4-0 spurt to get within 10-9. Davis earned sideout for the Huskers, and Foecke and Stivrins combined for five kills and teamed up for a block for a 17-11 lead. The Huskers closed out the sweep with a 25-19 win. Up Next: Nebraska finishes the regular season with two home matches next weekend. The Huskers host Ohio State on Friday and Maryland on Saturday, both at 7 p.m. on NET and the Husker Sports Network. Saturday’s match will be Senior Day for Nebraska’s three seniors – Mikaela Foecke, Kenzie Maloney and Brooke Smith.